The Millstone Township Board of Fire Commissioners is pleased to report that the 2018 budget and truck referendum were both approved. A total of 235 residents came out to vote. The budget passed by a vote of 199 "yes" to 34 "no". The truck referendum passed by a vote of 205 "yes" to 26 "no". There were no absentee votes cast. 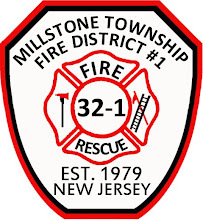 On behalf of the Board of Fire Commissioners, and the entire fire department, I want to thank the residents of Millstone Township for their overwhelming support of the budget and truck referendum.The fire commissioners worked very hard to present a budget and referendum that did not require a tax increase. We are grateful for the confidence of the voters, and the Commissioners will continue to manage the fire district's finances in most prudent manner possible. Two seats on the Board of Fire Commissioners were up for election this year. Anthony Marra received 170 votes and Larry Cier received 164 votes. Both incumbent commissioners ran unopposed.